Nameplates give burial vaults a personalized touch. They are a standard feature on all of our burial vaults. The nameplate includes the name of the deceased and the birth and death dates. 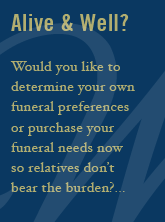 Mickelson & Ray offers disinterment services. If it becomes necessary to move a vault from one location to another, Mickelson & Ray can assist with these services. We handle everything from locating the vault to relocating the vault to a new location. Vault Transfer is a service available between Wilbert licensees and dealers. Wilbert Burial Vault uses the vault transfer service when a burial request has been made outside of the licensee territory. The location of the cemetery is needed to determine the appropriate Wilbert licensee or dealer. Since the services offered by each Wilbert licensee vary, the licensee work together on a per burial basis to determine the services, such as tents, grass, chairs, and grave digging, that each licensee will provide for the burial.